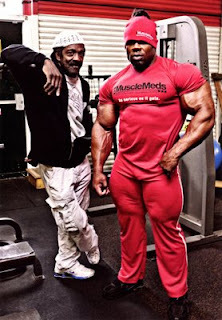 So I was surfing the web as usual and I found this picture of Kai Greene (great wise bodybuilder). This is no ordinary man in terms of size and the depth of his thinking you will see in the picture below. He tells it like it is and tells you that you do not have to be the heaviest lifter to get big, defined and be a top class bodybuilder. You can check his videos on youtube and bb.com they are truly inspirational and make me respect Kai even more. I remember in one of his latest videos towards the end of 2011 he was working out with this other guy, they were going to do a leg workout during that session, while they are still walking on the treadmill Kai tells the other guy that they are not warming up by walking on the treadmill the workout has already begun. He was like you need to squeeze and visualise which muscle you are working out and imagine it growing, imagine it becoming what you want it to be like (not in those exact words but along those lines). What I got from watching videos of Kai is that he is not just another bodybuilder, he takes it to a whole other level, everything he does is linked and ultimately leads him to a top Olympia position. He is all about the mind-muscle connection, he believes that you should believe and visualise your muscles growing as you work them out and know exactly why you are doing that exercise and which part you are trying to target. I do not want to be as big or close to as big as Kai but lessons can be learnt from his way of looking at building muscle even if you do not have a dream of being Mr O some day.